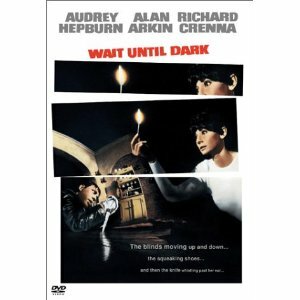 Wait Until Dark - Starring Audrey Hepburn as Susie Hendrix, a woman adjusting to being blind, and Alan Arkin (yes, the grandfather from Little Miss Sunshine!) as Roat, this movie scared me out of my mind as a teenager. After a woman slips a heroin-filled doll into Susie's husband's bag at the airport, three men try to search Susie's apartment for the doll, using Susie's blindness to their advantage, trying to terrorize her into giving up the doll's hiding place. Filmed in 1967, Wait Until Dark may seem slow to people used to movies like Saw. When I watched with my friends freshman year of college, they did not seem particularly terrified - until the end. That one moment that made them all scream justified my recommendation. Ha! I thought, Take that! I told you it was scary! Rear Window - One of Alfred Hitchcock's best, in my opinion, Rear Window is the film on which Disturbia was based. After an accident, photographer Jimmy Stewart is stuck at home with a broken leg. To entertain himself, he watches his neighbors across the courtyard of his apartment complex and dates Grace Kelly. Mostly, this involves watching a broke musician throw parties, a young woman get stood up on dates, and an older woman dig in her garden, until one night, he thinks he witnesses a murder. For modern audiences, Hitchcock's suspense can seem outdated, but Rear Window has moments that made me freeze and had me yelling at the characters on the screen. To me, that is always a sign of a good film. 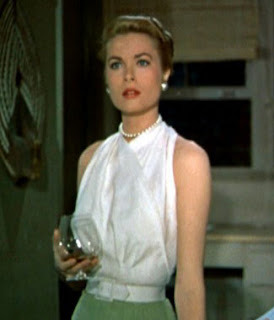 Grace Kelly: Keeping murder investigation a classy affair. The Others - More creepy than frightening, my favorite part of this film is the mystery running throughout. It stars Nicole Kidman as a woman waiting with her two children for her husband to return from the war. When strange things start happening in their huge manor house, she begins to think that someone is hiding in the home and harassing the family. She even starts to suspect that the house is haunted. During the entire film, you feel that something is not quite right - with more than one twist, it makes for a good, creepy movie night that will make you want to leave the lights on. 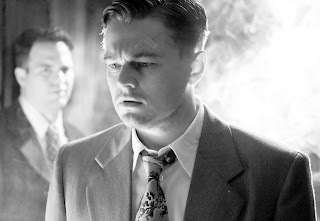 Shutter Island - If you don't watch this for the thrill, watch this for Leonardo DiCaprio. He's handsome even when he's freaking out. Since this film was so recent and popular, I won't say too much. One afternoon at the media library, I suggested the movie to a girl who was looking for something to watch that weekend. Her response: "Oh, is that the one where <gives away the ending>?" I hadn't seen it yet. Thanks, girl. But even when I did finally watch it, it was surprising and captivating, and you should see it, too. Confused, unsettled, but looking good in a suit. Shaun of the Dead and Zombieland - Blood and gore are half the reason I don't like scary movies, and so by default I tend to avoid zombie movies. With that in mind, I was skeptical when I rented both of these films. However, both were hilarious enough that I got over the gore quickly and just enjoyed them. They're great takes on the zombie apocalypse and even suggest some good survival techniques! Let the Right One In (Swedish) or Let Me In (American) - I think it involves vampires, and it was known around the Askwith Media Library as one of the most terrifying recommendations you could make aside from Zardoz. The Ring - I was scared for three days - three full days - just from listening to a seventh grade girl describe the plot during French class. I don't think I will ever be brave enough to watch it. Paranormal Activity - Okay, I have seen this one. It is really, really creepy and gave me nightmares. It's great if you like ghost/supernatural movies. The Sixth Sense - One of my favorite scary movies that is legitimately scary throughout. Don't let anyone ruin the end for you, but if they do, watch it anyway because it's great. Here are some delicious recipes for unique popcorn to munch on while you watch! What are your favorite scary movies? Which ones are scariest or least scary? No scary for me , thanks :P I'm chicken!